I remember many late-summer afternoons when I was required to help my mother put up canned vegetables using Mason jars and a huge pressure cooker. As we sweltered in the steam-filled kitchen, I remember thinking there has to be a better way. It seem that inventor Evan Euphrat had the same thought. He’s a chef and gardener who needed a same, reliable and convenient way to preserve foods. His solution is the Can Can, a modular system that replaces the heavy pots and antique methods that my mother and her mother used. 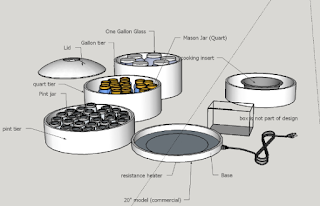 Euphrat’s design for the Can Can is posted in the Invent section of Quirky, a website that sells unusual products and provides community feedback for new product ideas. If the Can Can gets enough positive feedback, it can move closer to actual production. Check out the Can Can profile and leave your comments at Quirky.